For the last few weeks, almost on a daily-basis, there have been articles from USA Today to Huffington Post to NBC to ABC to the Christian Monitor, all taking about the cost of textbooks. On one hand, I applaud reporters bring this to the attention of the average consumer and the public, but I'm also disappointed that the vast majority of articles fail to acknowledge the Open Educational Resources movement or when they do, it's usually to downplay or discredit it. Below is an amalgamation of letters to editors that I sent out that never got published but I figured they still needed to be out there for people to read. As we enter into the fall, students everywhere will be going to or going back to college. Many of these news outlets have been remarking about the skyrocketing costs of textbooks—up over 1000% since the 1970s. Because of the nature of textbooks and higher education, it has become an increasingly exploitative market with publishers undermining a second-hand market of reselling textbooks by publishing annual or biannual editions (Because history textbooks need a new edition every two years) or creating locked content online that requires potential further purchasing (and which the student loses access to within a year). For students, parents, faculty, and administrators lamenting these exorbitant costs (upwards of $1000+ a year), I encourage all to advocate for open educational resources (OER). OER are free content available online that instructors can use, edit to their liking, and redistribute to their students. In the last decade, the OER movement has worked hard to produce high quality content such as videos, lesson plans, learning objects, and even textbooks that instructors can integrate into the course for free. A quick look at OER Commons, one of the most well-known OER repositories will reveal ample content for many faculty. You can also get a nice tour of the OER landscape by visiting North Shore Community College's LibGuide on OER. The OER movement bypasses the traditional market entirely by freely producing and sharing content that will help their students learn without making them pay extra. Students gain access to their learning materials on the first day and keep them for as long as they chose. Colleges supporting faculty in creating or using OER find that both faculty and students are happier about the opportunities it affords them. There are also people like David Levin, CEO of McGraw Hill (the biggest of textbook publishers) who are trying to convince students and faculty to "go digital". Of course, for his company, going digital means buying their digital products which will increase their profit margin significantly, while eliminating a secondary market for textbooks. It's not just about going digital. In his advocating for digital textbooks, he forgets to mention a few things that are worth noting and make his plea not just dubious but misleading. His argument seems to say that he empathizes with students and faculty and that his plea is really on their behalf, but it's not. The digital textbook racket is even more menacing for students and faculty than the physical textbook business model. He's using the platform of expensive textbooks (something he contributes to as part of McGraw-Hill) to bait and switch faculty and students into etextbooks. The problem is that McGraw-Hill tactics with etextbooks are even more exploitative than their tactics with physical textbooks. While with textbooks, students can hope to have a year or two before the publisher throws out a pointless new edition, etextbooks offer no secondary and cheaper market. Instead, everyone must pay the same price for entrance and there is no opportunity for the market to level out the real cost of textbooks (usually pennies on the dollars of the original cost). It seems clear that publishers are enacting the same mob-like extortion practices as they did with the physical textbook, but now, they really do control who goes and who sees what. But it gets further problematic from there. Students don't even own their learning. When students purchase physical textbooks, they own the physical copies. With etextbooks, students only buy access to the content and typically, they lose access within 6 months to a year. So even if students are paying less (for now), they are still subject to losing out on owning and reselling. If they want to keep what they bought, they need to keep paying. That would be like buying a book on Kindle and then being told by Amazon that you need to pay to read that book again in a year. Levin sidesteps the real game-changer for improving student costs of learning materials in higher education; the words he's afraid that students and faculty will hear and advocate for: Open Educational Resources (OER). 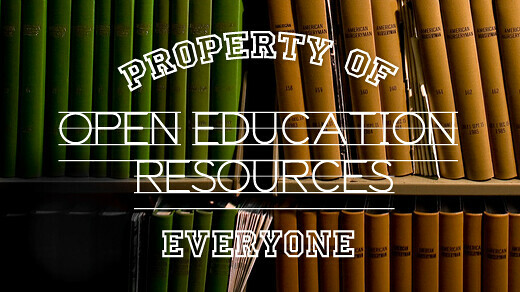 There is a movement throughout the world for Open Educational Resources. These are free and rich educational materials that includes lesson plans, learning guides, videos, audio content, and yes, even textbooks that faculty can incorporate into their classes. Faculty are not only able to provide these for free to students, but they can also edit, remix, and take bits and pieces from different resources. Rather than being stuck to one resource, faculty and plug and play a wide range of content to enrich student-learning. OER provides faculty with not only more flexibility and range of materials, it means students have instant access to their learning materials on day one and can keep them for years after. And publishers like McGraw-Hill are overwhelmingly concerned about OER because it is a disruptive force for the textbook industry (a legal Napster, if you will). After years of exploiting students and faculty, the textbook industry is on the brink of collapsing because OER provides the same quality educational resources as the traditional textbooks (in fact, it offers more quality since it uses media-rich content) at a fraction of the cost and unlike Naptster's original format, it's practices are entirely ethical and legal. To learn more about OER, check out OER Commons or the NSCC LibGuide on OER.